Moo's Sports Louge is the new restaurant located in the LRC second floor. They have setup special pricing for all Fragapalooza 2016 participants at 10% off the regular menu for anyone with a Fragapalooza 2016 ID Tag, as well as they will have daily specials located at the restaurant for your consuming pleasure. Check 'em out at the event for all your local needs at this great price! Microsoft joins us at Fragapalooza!!! 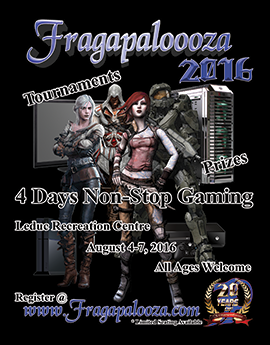 Microsoft is sponsoring Fragapalooza 2016 with some great prizes and tournaments!!! We are very thrilled to have them at the event this year and we know they are bringing their game with them! They will be onsite with XBox Ones and games to play as well as Tournaments to sign-up for! Halo, Killer Instinct, Forza are all on the docket thanks to Microsoft. See you at the event and check out the Microsoft Store in West Edmonton Mall if you get a chance! Play Hard, Sleep Well, Play Some More! Holiday Inn & Suites Edmonton Airport and Conference Centre (1100 4 St, Nisku, AB T9E8E2) - Just a short cab ride to the LRC, this location is offering specific discounts for Fragapalooza 2016 Participants. Use their online booking system, or call 780.979.0839 to book your suites (Map: https://goo.gl/maps/EtYfqcvRaTA2). They are offering: $109.49 + Tax per room per night based on 1-4 guests, including full hot breakfast daily in the restaurant. Days Inn Edmonton Airport (5705 50 St, Leduc, AB T9E 6Z8) - Also a short cab ride to the LRC, this location is offering discounts to all Fragapalooza 2016 Participants. Use their online booking system (use code LBBG), or call 780.986.6550 to book your suites (Map: https://goo.gl/maps/JHLKDMTWeW32). They are offering: $109.99 + Tax per room per night. Best Western Plus Denham Inn & Suites (5207 50th Ave, Leduc, AB T9E 6V3) - Another a short cab ride to the LRC, this location is offering discounts to all Fragapalooza 2016 Participants. Use their online booking system (use code DISC01), or call 780.986.2241 to book your suites (Map: https://goo.gl/maps/eaxmpzG6UWy). They are offering: $109.99 + Tax per room per night. At the Event - The North part of the seating plan shows a small area that can be used to put down single sized sleeping bags/beds, but is limited to first come first serve, and may be subject to removal should the event need more seating for participants. As you can tell already we are a pretty full venue this year, so while we hope this area will be available for this use, we cannot guarantee that to be so! NOTE: While you may find lots of areas that look appealing to drop your sleeping gear down to rest with, we unfortunately are limited to the LRC's Soccer Pitch area where the Fragapalooza event itself is held, and won't be able to offer any other areas in the LRC for sleep accommodations. Please keep this in mind when planning your stay while at the event. Hope this helps you out in your search for that pillow to rest a gamer's head on, but don't rest too long lest you miss out on all the fun!!!! Here is the Poster for this year's event. Download and share as much as possible as we push for the last little bit here before it all begins! OnX Enterprise Solutions starting working with us in 2015 and is back for Fragapalooza 2016 as a sponsor for our 20 Years in the Making event! Check them out for various IT Services and Solution needs! In addition to the previously announced tournaments, we will be running a couple side tournaments during this year's Fragapalooza. For those of you with a creative bent, we will have an official creative mode Minecraft server where you can compete to design the coolest or most interesting construct. Those with a need for speed will have an opportunity to drop by our Forza racing setup and attack the time trial. BioWare, a Division of EA, and Edmonton based company is stepping to the plate again this year! First back sponsoring Fragapalooza 2015, we are so pleased to announce them back for our 20th Year event as one of our local gaming community sponsors! Thanks for join us this year for Fragapalooza 2016!